Tampa Bay Rays uber prospect Wil Myers was named the International League Batter of the Week, after hitting .423 over the past seven days. Myers collected four home runs, 15 RBI and a 1.038 slugging percentage and raised his batting average to .280. Myers was the Tampa Bay Rays’ key acquisition in an offseason trade which sent James Shields and Wade Davis to Kansas City. Last year he hit 314/.387/.600 with 37 homers and 109 RBI last year combined at Double-A (35 games) and Triple-A (99 games). 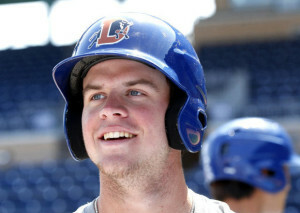 The question most people are asking is when Wil Myers will be called up? Opinions and theories are many.ESPN’s Keith Law recently downgraded Myers to number seven overall in his top 100 prospects in baseball. “Myers has had one of the worst starts of any player on this list, striking out nearly a third of the time while hitting for very little power, something I discussed in April when I saw Durham play. He’s actually been worse since that series, maintaining that low contact rate with declining results when he does put the ball in play.” Law said. Of course the budget conscious Rays definitely don’t want him to be a Super-2 in his arbitration years, but perhaps the best reasoning for not calling up Myers is the Rays don’t have a need at this point. The Rays are averaging 5.6 runs per game since April 16, And a few extra at-bats in Durham isn’t going to hurt him. Myers strikes out around 30% of the time. Still if Myers continues to push the issue offense of early and the Rays determine he has adopted the Rays way of approaching the game, it shouldn’t be long before the young slugger debuts at the major-league level.